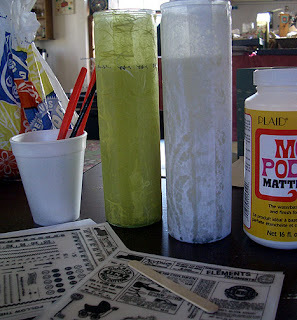 Last week I told you about Aunt Martha's fabulous Iron Transfers. Here's is another sample from these fabulous, kitschy packages. They are perfect for making tea towels and pot holders. But, what else could you do with them? We are looking for ideas. We're having a give away! So, put your thinking caps on, and let us know what creative use you come up with to use these transfers. Try to think of something other than the traditional use. We will reward your hard thinking. We will choose the most creative answer and reward that lucky person with one of Aunt Martha's Transfer packets and a pack of collage items from our own studio. You have some time to think about it, but don't wait too long. We will choose a winner Monday, March 31. Post your best ideas here. One of the treasures that Kerry and I found while cleaning out some of my mom's old sewing supply stash were bags and bags of old wool scraps. The material was originally used by my mother and grandmother to make suits and dresses for themselves in the 1950's and early 60's. For some reason, they saved the pieces left over from cutting out their patterns. Perhaps they couldn't bring themselves to throw out material which probably cost a lot or perhaps they had a project in mind; I'll never know. But that brought us to the question. What do you do with old wool? Aside from being odd shaped pieces, the fabric was in good condition. Kerry washed it all (on gentle cycle with Woolite). And then sorted the larger, usable pieces by color. And then we bagged it and put it away. Still sitting with the question, What do you do with old wool? 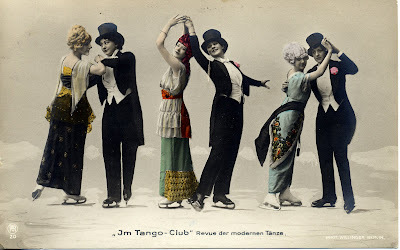 Even though the material is 40 or 50 years old, the colors and patterns were still vibrant and interesting. There were blue boucle plaids, several different colors of herringbone, light greens, dark greens, and tartans. We have also have vibrant reds, oranges and pinks. There are more sedate browns and greys. Some of them are more masculine, and others quite feminine. 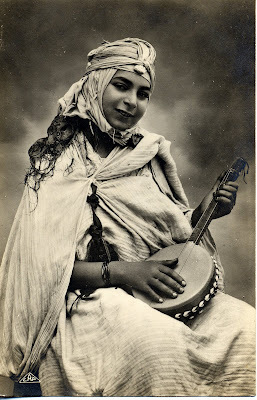 I have seen photos of my mom and grandma in dresses made out of some of these materials. We each took some to play around with. I decided to make a few small clutch-style bags with my pieces. I liked the idea of using suiting material for a rather feminine design. 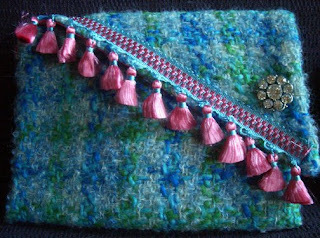 I paired the wool with bright trims, satin linings, and antique buttons and broaches. I really like the results. 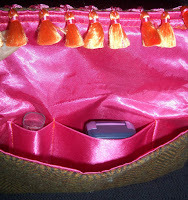 I added pockets inside each bag, just right for a phone and a lipstick. The tassel trim isn't at all practical, but neither is the bag. It is just a special occasion bag. Kerry made a beautiful tote bag for me using all the blue colored wools we had. Using our favorite patchwork patterns, she was able to incorporate all the different patterns we had. She accented the handle with brown and white ribbon and the result is quite nice. It has been a lovely winter bag to use. On the web I found several others with ideas about how to use old wool. HGTV.com highlights a "Trash to Treasure" feature that recycles old wool coats to be made into placemats, photo frames and pillows. Who knows, maybe I'll try one of those projects next. What would you do with old wool? And if you have any good ideas for wool, what about men's ties? We have a nice stash of old ties, too. I feel at loose ends lately. Maybe I just have too many unfinished projects. I felt I started off the year with a bang. We even had a tidy list of (attainable) resolutions to make this year great. So, self check here, how am I doing on keeping those resolutions? # 4, 9 & 21 - I have alternately consumed more wine and less wine depending on whether or not I am trying to shed a few pounds or recovering from one of my too many flu-like maladies of the season or if I am relaxing with one of my meals consisting solely of appetizers with lit candles for ambiance (#2 &11). # 25 - I have met this goal, we both have. My children have new, cute backpacks, and Kerry's girls have super cute Webkin's bags. #14 - It is a funny thing, when you water plants, they grow beautiful, new green leaves. My plants are thankful for the attention. 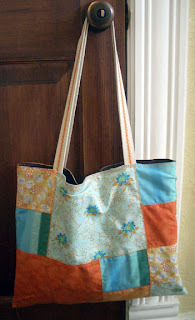 #23 - We have made lots of fabulous tote bags, which we have shared in our blog. Now we are looking for new designs and new patterns. And also we are looking for lots of occasions where we can tote our new bags. While there are other resolutions that I am "working on" I feel that I have too many unfinished projects and so many supplies to work with. Sometime the choices can be a little daunting. More is sometimes too much. Currently on my project to do list I have two candles to finish for my home, one or more tissue boxes, also for my home, an unfinished magnet board and some tote bags and drawstring bags that I want to use for gifts, and that's not all. I guess I had better get moving on some of these unfinished projects. It's as if I have a creative "writers block." Just how do I get motivated when I am feeling overwhelmed and uninspired at the same time? Perhaps it is malaise. Wikipedia even talks about a "winter malaise." It is a real thing. So my feeling of being out of sorts can be attributed to, "the culmination of the body adjusting to cold winter conditions and a possible depressing atmosphere due to either being forced inside due to the cold, or forced into a mundane daily routine because of the winter conditions." 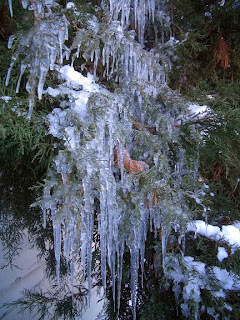 Now that it is nearing the end of March, I would have thought the winter doldrums would have passed. Hopefully a dose of spring sunshine and fresh air will snap me back into shape. So, off to work on some unfinished projects. I will keep you posted on the results. Any ideas for battling malaise? you keep me posted. Spring has started here in Colorado. The first bloom has appeared in my garden. 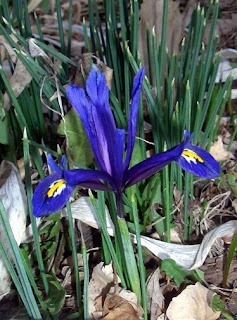 It is a tiny, early iris. 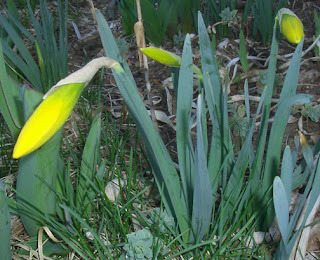 The daffodils will be next. If we can avoid heavy frost and if I can figure out a way to stop the squirrels from digging up everything I plant, we may have some pretty bouquets this year. Does anyone have any ideas about the squirrels? Have you met Aunt Martha? 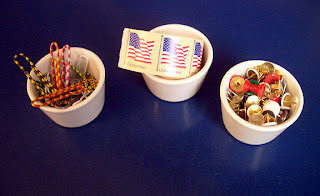 Kerry and I were shopping one day and found a fabulous craft item! We were fascinated by the pattern choices, the titles and the kitschy packing. We quickly snatched up 7 of these little beauties! There is one problem, however. We don't know what to do with them! 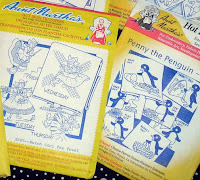 The stated intent of Aunt Martha 's> Iron On Transfers is to provide a template for embroidery or fabric paint. Neither of us fancy embroidery, nor do we want to start. But, there must be some other applications for these kitschy-cute transfers. Each packet contains one large folded sheet of newsprint-like paper with simple line drawings, in reverse. The instructions state that you can get several clear stampings from each transfer by using a hot iron. 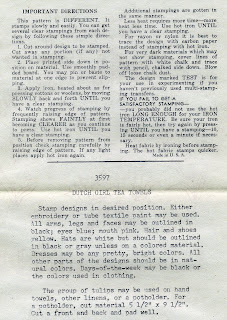 I found the directions for the Dutch Girl Tea Towel Transfers most amusing. It emphatically states, "This pattern is DIFFERENT." Different from what, I ask? They go on to give specific instructions for hair, eye and dress color for the Dutch Girl. The other patterns are equally amusing, with names like "Chicken Romance," "Monkey Business," "Dancing Dolls," and "Barns, Barns. Barns," who can resist? They are reminiscent of the tea towels which hung in my grandmothers kitchen. You know, the kind you can find at garage sales and antique stores that say things like "Wednesday - Wash Day." We thought the store must have found an old, forgotten box from the 50's, and put them out to get rid of them. But no! Looking at the little packets, we discovered that many of them have print dates in this decade. Who knew? We're having a give away! So, put your thinking caps on, and let us know what creative use you come up with to use these transfers. Try to think of something other than the traditional use. We will reward your hard thinking. We will choose the most creative answer and reward that lucky person with one of Aunt Martha's Transfer packets as well as a packet of assorted collage items from our own studio. You have some time to think about it. Since we're going on Spring Break next week, we won't choose a winner until March 31. Good Luck! We can't wait to see what you come up with! I am suffering from boredom. It is a horrible malady--getting in the way of creative process. I hope that what I am feeling is just an "early stage in art" and that a "clear product will emerge." Hopefully Fitzgerald is correct and not Beaton's interpretation. 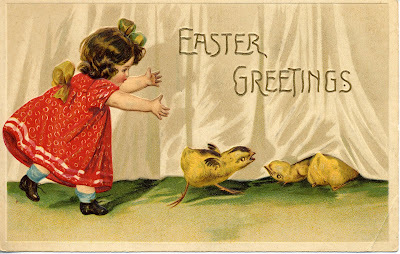 Not having any St. Patrick's post cards, here is an early Easter greeting. Perhaps you may be able to use it this week. How far can 2 yards of fabric take you? I recently purchased two yards of shamrock theme fabric to make something for myself and some gifts for family. I had no idea how far those two yards of fabric would take me. One square mini-tablecloth for my pub style kitchen table. Two bread basket liners, one for me and one for Mom. One long runner for my wine/bar rack. 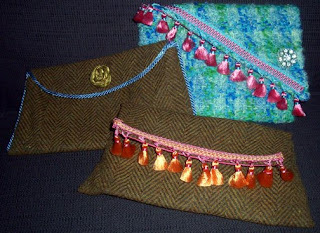 Four little tissue holders for purses. One for me, one for Mom, one for Aunt Molly and one for Aunt Gael. I was so excited with my fabric purchase and use. I was determined to use every last bit and I did. With Easter fast approaching, Kerry and I were looking for a fun project to do in the studio. We were looking for something that encompassed creativity but could also serve as a decorative item. So we started looking for ideas, turning to the trusty Martha Stewart, we found several ideas in the Easter section of her website. 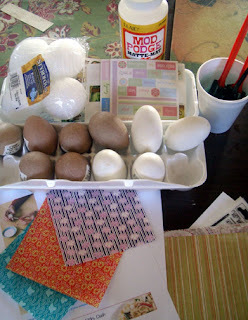 We purchased wooden, Styrofoam, and papier-mache eggs from Michael's and Hobby Lobby. We pulled various stickers, rub-ons, origami papers, printed tissue papers, paint and glitter from our stash of supplies. 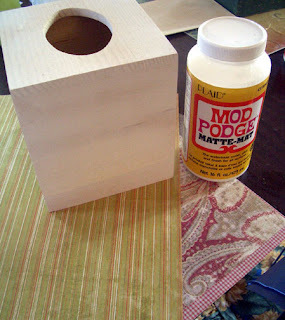 Of course we added the ever-present Mod Podge, and a few foam brushes. We gathered our materials, and started a round of speed crafting. As soon as we got started, we were on a roll. 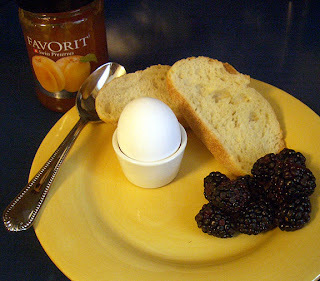 We could make monogram eggs, eggs with dresdens, butterfly eggs, painted eggs, and glittered eggs. Won't they all look pretty in a centerpiece? 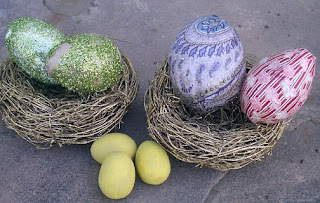 Using a little faux nest or a pretty glass bowl, they will be a nice addition to our Easter tables. We want to invite you to join us for this project, next week. Come to the studio for a FREE class. We will provide collage and decoupage materials, paint, glitter, glue, paper, and lots more! 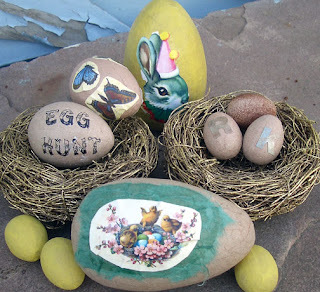 You bring your own eggs and decorate as many as you wish. You may bring wooden, papier-mache or Styrofoam eggs. If you prefer real ones, please hard boil or blow them first. The class will be at the studio. Leave a comment with your email if you need directions. We should do our homework. We should take out the trash. We really shouldn't wear spandex, should we? We need to mop the floor. We should practice our handwriting. We should bag the meat separately from the vegetables. We should finish the projects we start. We should clean our rooms. It's about time we get a vasectomy. When a woman loves a man, there isn't anything she won't do. 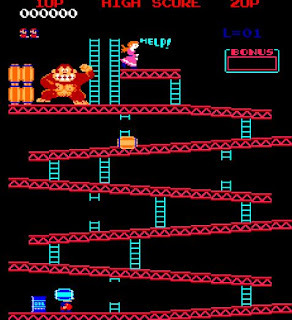 I love my husband so much that last night I watched King of Kong- A Fistful of Quarters, a documentary about video games and the rivalry over being the high scorer on Donkey Kong. It took me back to those early eighties days and my beloved Atari 2600. Frogger was personally my favorite, but I had to have the machine set to easy mode in order to do well at all. This movie was not made in the early eighties but somehow all the people in it still appeared to think it was 1982. The long hair and multitude of video game t-shirts proclaiming their love for Missile Command and Ms. Pac-Man were everywhere. There was even someone in the film who refereed to himself as Mr. Awesome. Now remember this was an actual documentary and not about fictional characters. Mr. Awesome was anything but that, but I digress. My husband really wanted to see this movie and I love him dearly so I agreed to watch with him. I do admit it was interesting and I laughed far too frequently. One of the most fascinating "characters" in the movie was a woman named Doris Self. She was the 79 year old champion at Q-bert. Do you remember Q-bert? Cute little round guy, long horn like nose. She cracked me up. I was very sad to see at the end of the film that she passed away in 2006. I can't help but look up to a 79 year old woman who is the world champion at Q-bert. Now admit it, when you looked at the title of this post, how many of you thought this would be about Video Games? That's exactly what I thought! I was cheated of an hour of sleep this weekend, as were you. We turned our clocks ahead an hour so that we may all "Spring Forward." As for me, I just want my hour back. For those of you reading our blog outside of the United States, we just turned our clocks back in accordance with Daylight Savings Time. Many, but not all, countries observe this time change. For you trivia buffs, I just learned it was one of Benjamin Franklin's many ideas. 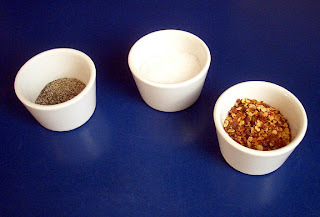 Spice containers while I'm cooking. 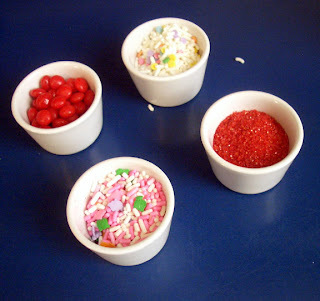 Holding sprinkles for decorating cupcakes. And if I run out of bowls, I have a few back-up options. What are your useful collections? And how do you use them? The adventures of Seamus and Malachy continue.......they have made their way to their permanent home in the backyard. They aren't too happy with their sparse landscaping but I have promised to do some planting as soon as it warms up. Malachy gets weary with tax season upon us, occasionally falling down in exhaustion. Seamus continues his pursuit for that special someone and that's where this story really begins. Seamus was laying in the yard, dreaming of the waves lapping at his toes and enjoying a nice rum punch in a pineapple cup when the dog? of his dreams showed up. Yes, a beefy bulldog with a beguiling necklace of billiards balls sauntered over to Seamus. They looked each other over sensing an odd familiarity with one another. The dog stared longingly at Seamus' tilted red cap and Seamus mused at the weight of the bulldog's necklace when recognition hit them both. This was Frank, the bulldog from pooldawg.com. The premiere billiards seller on the web. Frank was the official mascot for the site and was brought home by Kerry's husband, Mike. Mike runs Pooldawg and Kerry and Rachel design their billiards jewelry line. Seamus and Frank were long lost adopted brothers!!!!!! What a miracle, they finally found each other. Out of all of the backyards in Colorado, they ended up together, reunited at last. Go, wipe those tears from your eyes and then check out pooldawg.com. March comes "in like a lion, out like a lamb," or so the saying goes. Our March seems to have a case of multiple personalities. We hit a high of 72 degrees on Saturday, March 1. The kids were happy to be outside, riding their bikes and running around the park. The snow came fast and furious. Thankfully it stopped during the morning and only left three or four inches for us to deal with. The high was only about 32 for the day. With a 40 degree drop in temperature in 24 hours, it's a wonder that we aren't all catching colds. (I know they say you can't get a cold from the weather, but such a drastic change in the weather has to take it's toll on our bodies.) 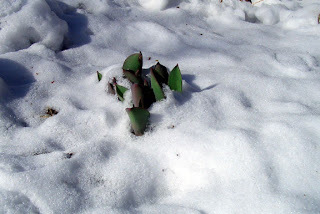 Hopefully it didn't take it's toll on my tulips which are peeking out of the snow in this picture. 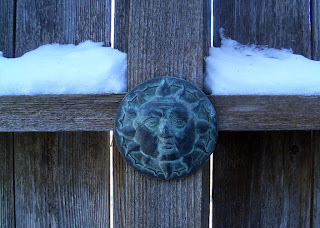 Our little teaser of spring, even summer-like, weather has left me pining away for warmer weather. I can't wait for the season to change. 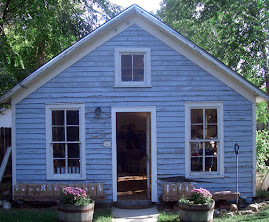 I want to see what comes up in my garden, plant new flowers and spend time out doors. But the wind and chill keeps me inside. As Kerry mentioned, the weather leaves us to our at-home tasks and art endeavors. So I sit, at home, making things to use this summer. This is my version of Kerry's patchwork bag. I can't wait to take this one to the park for a picnic, or to the beach with my book inside. Doesn't it just scream "SUMMER!" I love the bright turquoise and orange mixed together. It is definitely a summer combination. The colors remind me of the ocean, the sunset, and tropical fruit. Okay, enough dreaming! So back to the March in like a lion thing, it really has nothing to do with the weather. While writing this, I learned it's really about the constellations, and how Leo (the lion) is in the night sky with regards to how Aries (the Ram or lamb) is positioned at the beginning and end of the month. I never knew. March is a month with many faces. It is American Red Cross Month and Women's History Month. If you are religious you can celebrate the days of St. David, St. Joseph and don't forget St. Patrick. 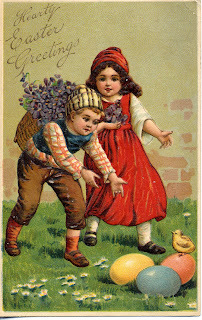 And of course, this year, there's Easter in March. And for those non-religious, you can celebrate National Reading Day and Pi Day. (Pi, like in math, not pie, like in yum-yum), and don't forget St. Patrick's Day! 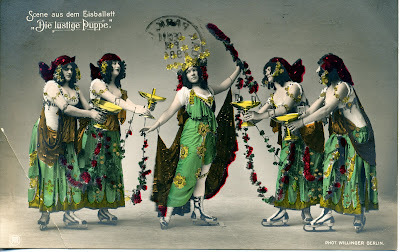 And then there's the Ides of March and the Equinox--the arrival of Spring. I can't wait for the weather to change. 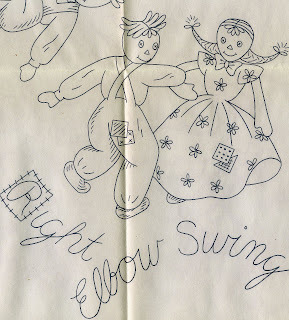 I hope old Henry here isn't correct, and that the warm weather comes as quickly as the first day of spring will come. Since the weather has been unpredictable at best, we have been working at home more rather than in the studio. 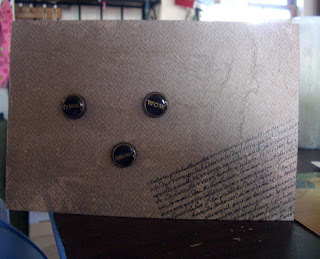 Which means we are sewing more, since that is our home time craft. 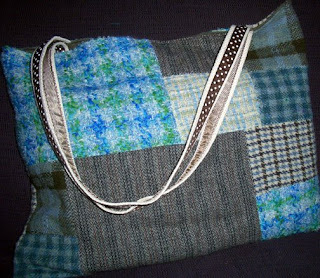 We have gotten some great new fabrics and have made some very simple pieced bags. 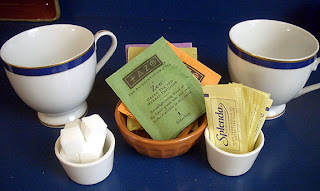 I am reluctant to call them quilting of any sort since so much more work goes into quilting. We picked out some great coordinating fabric and picked a simple geometric square design to start with. The best part of making a pieced bag is picking the fabrics to use in them. There are so many fabulous combinations. Mine are of course all in the Fall color palette and Rachel's evoke spring and summer. Try your hand at putting different colors and fabrics together and see what you come up with.